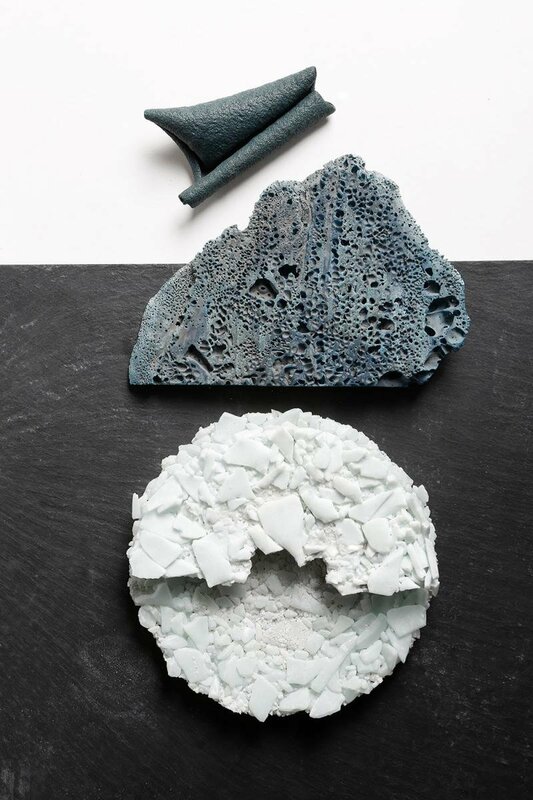 Minimalist, poetic, and experimental, Sophie Rowley uses thoughtful, innovative techniques to transform common waste materials into smoothly sculpted pieces that elegantly simulate natural forms and textures. New Zealander designer Sophie Rowley (b. 1986) obtained her B.A. in Fashion and Textile design from HTW Berlin in 2011, and, having interned with Alexander McQueen and Diane von Furstenburg, completed an MA in Material Futures at Central Saint Martins in London in 2014. 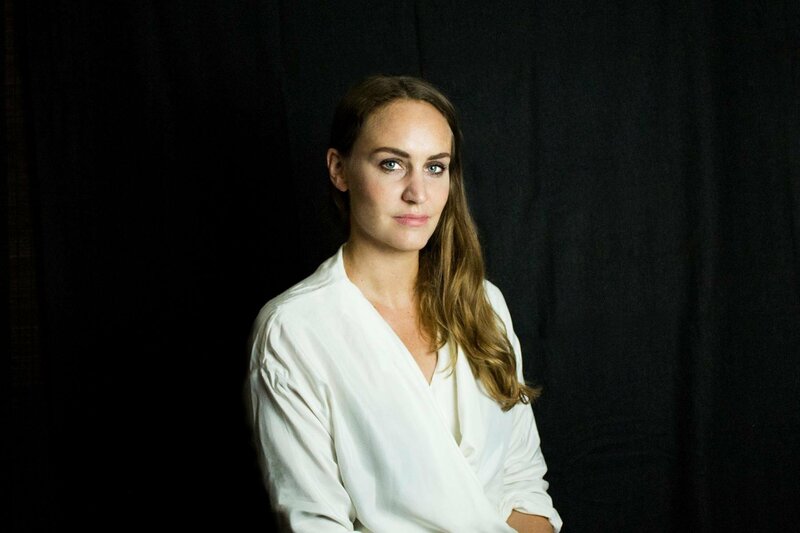 Following work with Faye Toogood and Godrej and Boyce, she established her own studio in Berlin in 2017. Through an endless process of research and experimentation, she pushes the physicality of materials to their limits, revealing new features and hidden, unexpected visual and textural qualities. 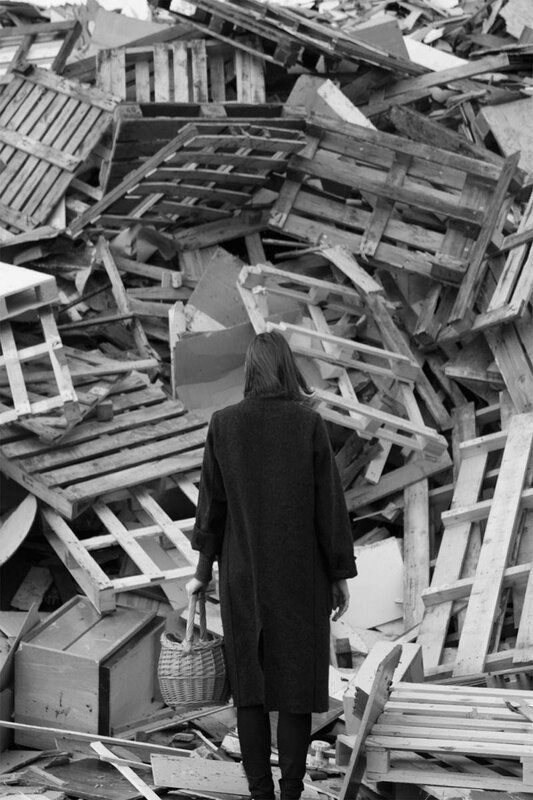 Conscious of the finite nature of raw resources, she regards waste streams as a future “quarry”, and is dedicated to the use of non-virgin materials in her work. Utilizing a wide range of techniques, her approach focuses on sustainability and innovative material development. 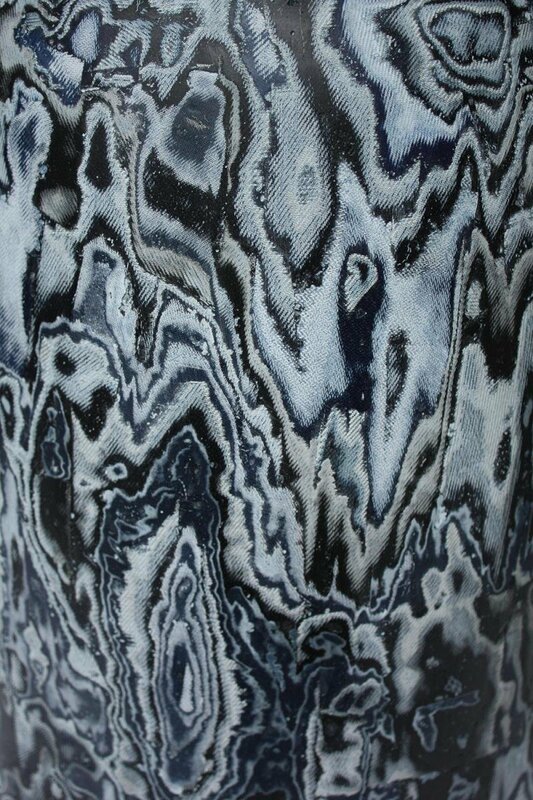 Rowley’s practice concentrates on the functional and expressive potential of common waste materials, such as denim, paper, Styrofoam and glass, which she subjects to a range of experimental processes. 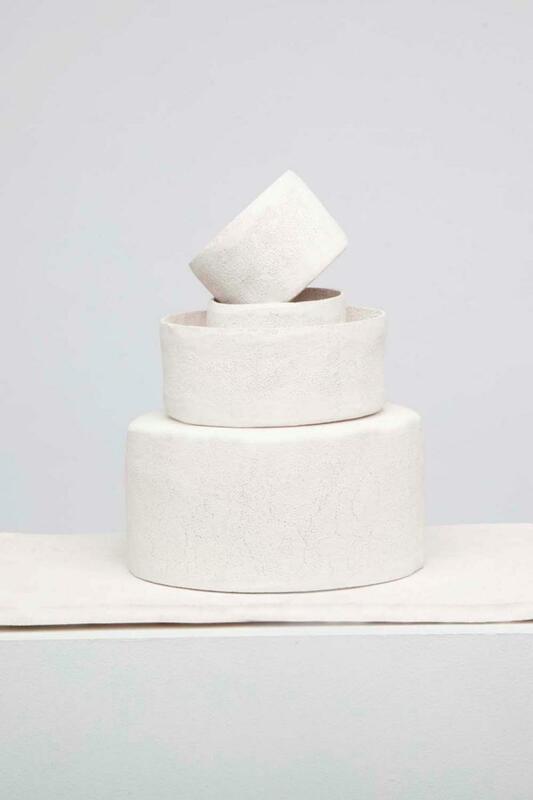 In so doing, she explores alternative resources and methods for material production by developing speculative interventions that could lead to a range of future applications. Her Material Illusions series brought together a collection of conventional waste materials which, having undergone a range of craft and experimental techniques, came to appear “nature-simulating”. With these bespoke material studies and concepts, she helps brands repurpose their own waste in unique and experimental ways, which look beyond the standard aesthetics often associated with recycled materials. Rowley’s Bahia Denim, which stems from Material Illusions, is manufactured using waste from the fashion industry. 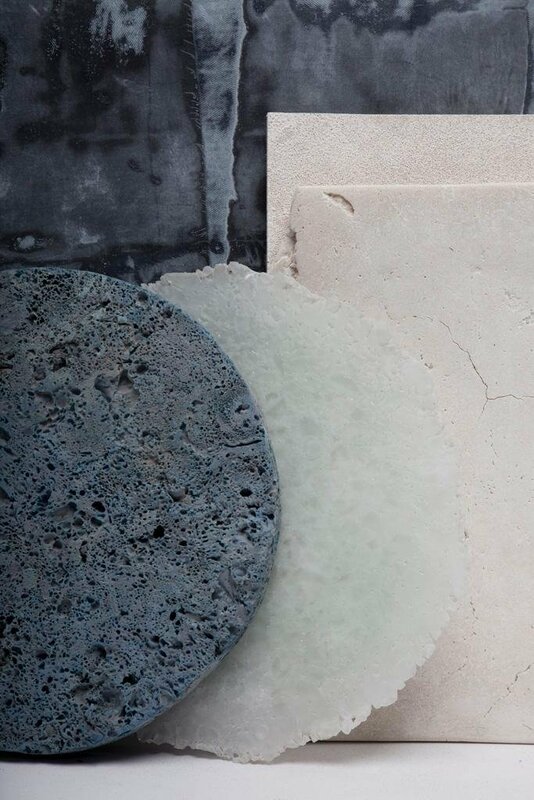 Draping denim offcuts over a mould, she adheres the layers together using bioresin. Once dry, the resulting material is carved to create flat surfaces, revealing a marble-like pattern – an outcome of the non-standardized nature of the waste, with its inevitable variations in size, shade, color and texture. As a result, each piece is unique. Named after a Brazilian blue marble, the resulting material resembles the beautiful surfaces of the naturally occurring stone. 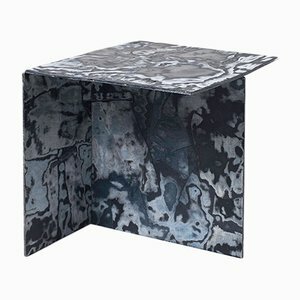 There is a poetic quality, meanwhile, to the manner in which Rowley enables these qualities to be expressed; there is a graceful lightness to the sculptural way she generates form, and her minimalist approach to furniture design ensures that the mesmerizing veins and inkblot, dreamscape cartographies of the material are brought firmly to the fore. 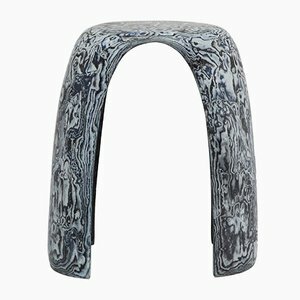 The Bahia stool sends the marble-like substance into a single, symmetrical arc, elegantly contrasting its smooth edges with the shifting fusions of fabric scraps within. 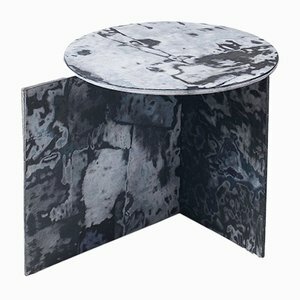 The slate side-tables from the series, meanwhile, playfully articulate the visual vibrancy of the layered denim in compositions that make use of simple geometries; in spatial composition, they resemble tidy, orthographic projections of squares, rectangles, and circular discs. 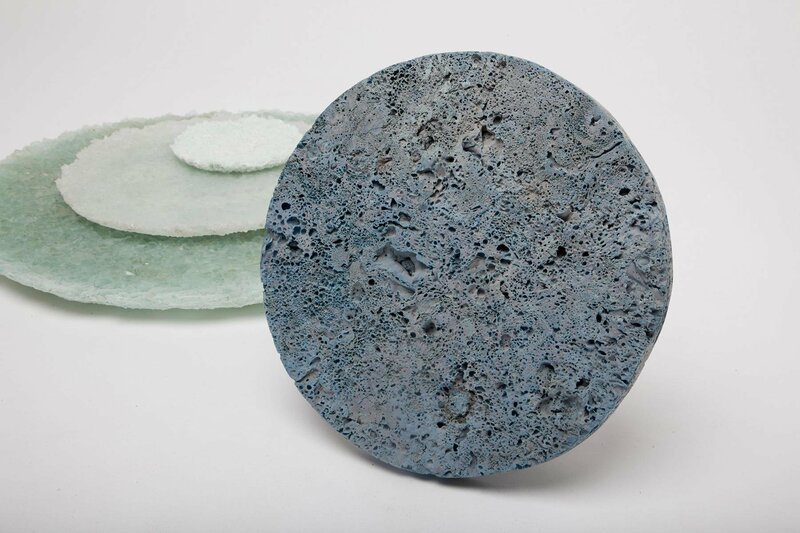 Rowley was commissioned by Nissan in 2014 to develop her Bahia material into a dashboard, which was showcased in a Tokyo as part of an exhibition focused on innovative materials. Material Illusions won the Surface category of New Design Britain Awards 2015, and in the same year, Rowley was commissioned by David Chipperfield Architects to create bespoke material studies for the Water Bar at Selfridges department store, London. 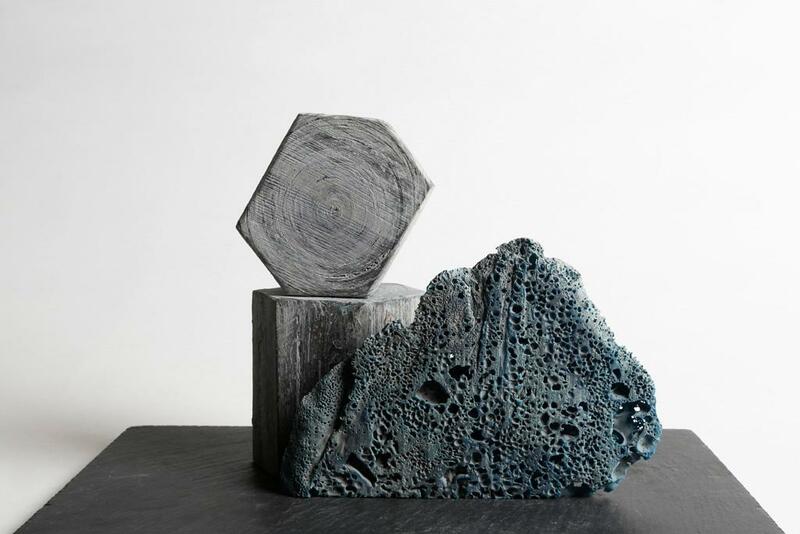 Her work is featured in Radical Matter: Rethinking Materials for a Sustainable Future, published by Thames & Hudson in 2018, and was exhibited as part of Poème Brut at Design Museum Gent in the same year.